(Reuters Health) — In a study of three rural Virginia elementary schools, both packed and school lunches almost entirely met nutrition standards, but those packed at home tended to have more calories, fat and saturated fat. “We assumed there would be differences between school and packed lunch, but not such stark differences,” said lead author Alisha R. Farris of the Department of Human Nutrition, Foods, and Exercise in the College of Agriculture and Life Sciences at Virginia Tech in Blacksburg, Virginia. “I also think, for a long time, people have viewed packed lunch as the healthier option, but our results show that’s really not the case,” Farris told Reuters Health by email. She and her coauthors used checklists to record the nutritional content of daily lunches at three elementary schools for five school days, with each researcher assigned to 10 students. Of the 1,314 lunches they observed, the school provided 57 per cent. Calories, carbohydrates, fat, saturated fat, sugar, vitamin C and iron were higher, on average, for packed lunches compared to school lunches. 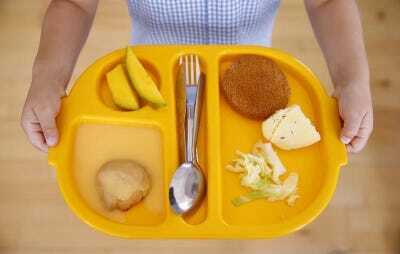 School meals averaged 512 calories and 13 grams of fat per lunch, compared to 608 calories and 21 grams of fat for packed lunches. Packed lunches averaged 10 grams more sugar than school lunches. Protein, sodium, fibre, vitamin A and calcium were lower in packed lunches compared to school lunches, according to the results in the Journal of Nutrition Education and Behaviour. About 60 per cent of public elementary and secondary school students in the U.S. get their lunches free or at low cost from the National School Lunch Program, the authors write, and the NSLP is required to meet nutrition standards aligned with the 2010 Healthy and Hunger-Free Kids Act. Both school and packed lunches were quite close to nutritional standards, according to Jason Schaub of The University of Arizona in Tucson, who was not part of the new study. Vegetables, on the other hand, are more common in school lunches, she said. The researchers did not measure what or how much the students actually ate for lunch. “Food-waste in the National School Lunch Program is tremendous, with reports of over 45 per cent of all food served going to waste, including over 50 per cent of vegetables served,” Schaub noted. Older kids may have more options for lunch so these results may not be applicable to them, Farris said. “Our results may not be applicable to other elementary students either, because of differences by state, region and local environments,” she noted. To make packed lunches healthier, parents could substitute water or milk for a sugar-sweetened beverage and substitute fruit for dessert, she said. “Involving children in the packing decisions is a great way to encourage them to eat what is being provided as well,” Farris said. SOURCE: http://bit.ly/14f6n91 Journal of Nutrition Education and Behaviour, online November 7, 2014.